These moist little protein-packed gems are as adult-friendly as they are kid-approved. 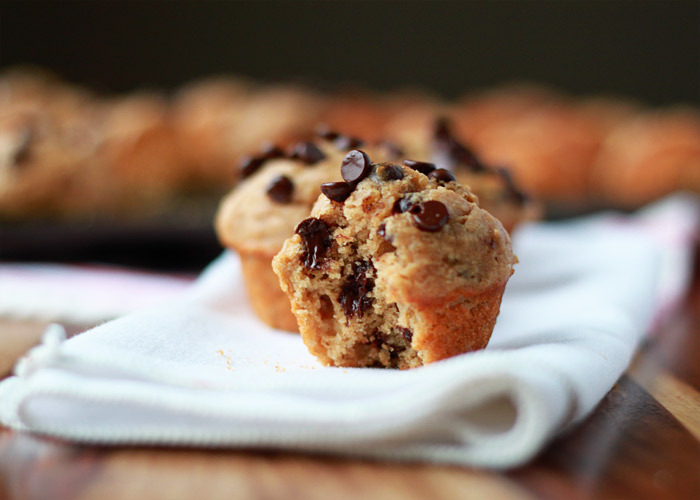 Make them even more irresistible by adding a few mini chocolate chips. Last week I promised more muffin recipes, and, well, I guess I’m not wasting any time. Because here’s another! These Peanut Butter Quinoa Mini Muffins aren’t just low sugar (no refined sugar), low in oil, high protein (for a muffin), and dairy-free. They’re also wonderfully moist, full of flavor, and just plain cute. AND they have a shockingly good sense of balance! Okay, so I may have used a hidden skewer to make that stack stay upright. A food blogger’s gotta do what a food blogger’s gotta do! 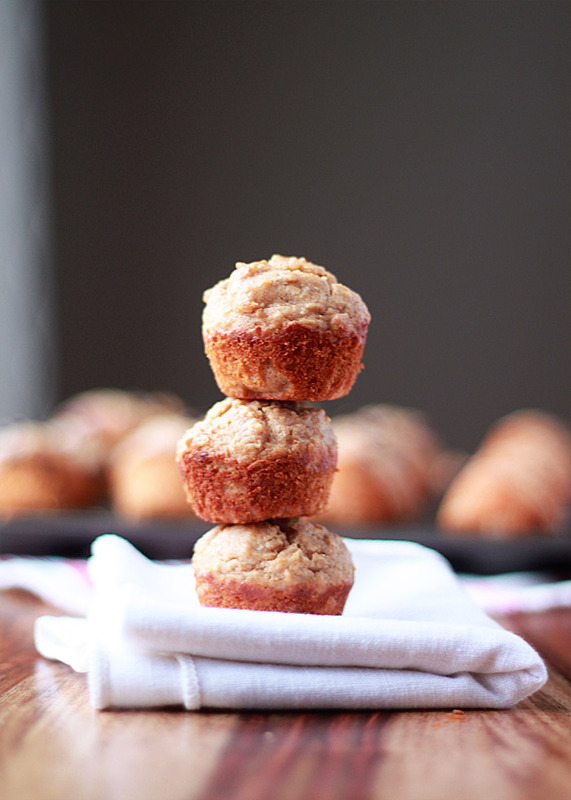 These muffins were my first foray into quinoa in muffins. It’s such a brilliant addition! I’d seen them around and decided to throw some cooked leftover quinoa into these to see what happened. Basically, the quinoa just sort of integrates in with the muffin – you really have no idea it’s there. But it helps contribute to a surprisingly moist muffin, considering how little oil is used in the recipe. And of course there’s all the Omega-3 and protein goodness that comes with the quinoa territory. Gotta love that stuff. This is my first one-dish-two-ways recipe that’s not veggie/carnivore, but instead adult/picky toddler. I absolutely get how sad the following fact is, but basically, my kid won’t touch muffins if they don’t have chocolate chips in them. I know, I know. I know. But I feel less guilty about that when the muffins have lots of other good stuff in them that she’s getting while she eats the chocolate chips. So there’s that. Sideways face. So for this batch, I made half with chocolate chips and half without. I love these without the chocolate chips, and I’m watching my sugar intake so they were perfect for me. But with chocolate chips? Yeah, they’re even tastier. They’re actually pretty irresistible. Another benefit to mini muffin making? The baking time! These things bake up in 9 minutes flat. No joke. Preheat oven to 400 degrees Fahrenheit. 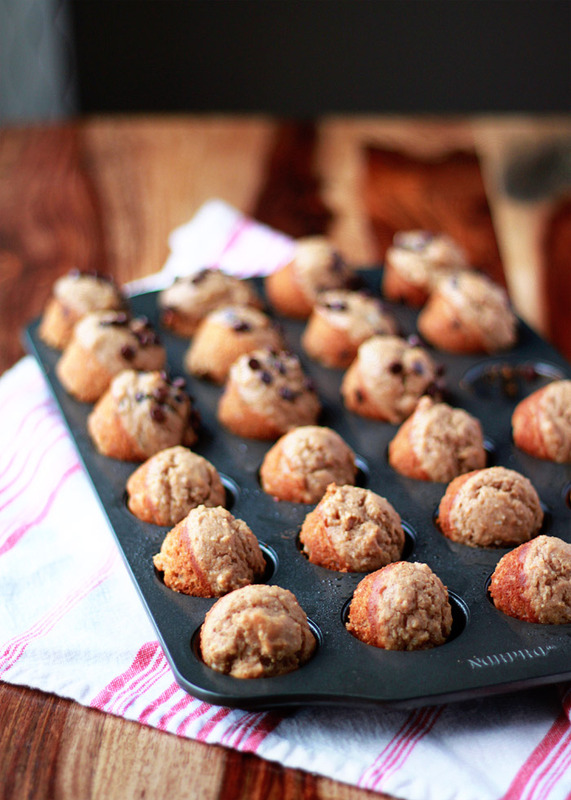 Grease the cups of a 24-cup mini muffin pan with a little coconut oil or an oil mister. Set aside. In a large bowl, whisk together the applesauce, peanut butter, and honey until well-blended. Stir in the coconut oil. Add the egg and whisk well. Stir in the vanilla and quinoa. In a medium bowl, whisk together the flour, baking powder, cinnamon, nutmeg, and salt. Pour the dry ingredients over the wet ingredients and mix with a whisk or wooden spoon just until blended. Stir in the chocolate chips, if using. *If you're adding chocolate chips to only half, fill 12 of the muffin cups with the plain batter (about a scant 2 tablespoons each). Then stir in 1/4 cup chocolate chips to the remaining batter and divide the chocolate chip batter among the remaining cups. Bake until the tops spring back when you gently poke them with your finger, 9-10 minutes. Remove from oven and let cool for about 5 minutes. Remove from tins and place on a wire rack to cool for another 5 minutes. Serve. Muffins keep in an airtight container for 3-4 days. They also freeze well. This also adapts well to standard-size muffins. I find I get about 10 good-size muffins and they take about 14-15 minutes to bake. 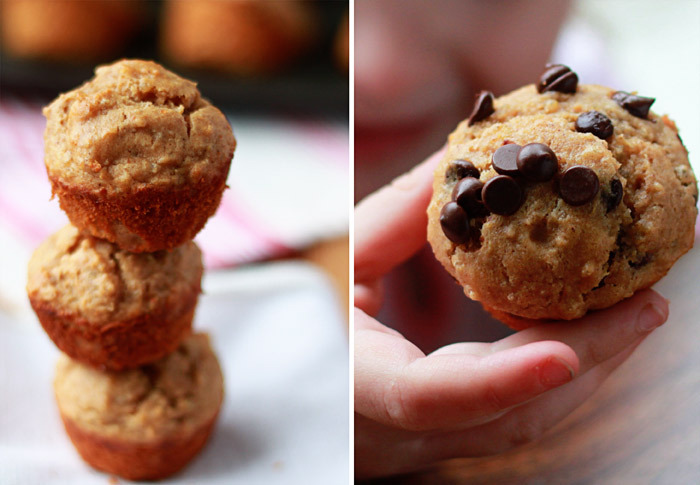 Mini muffins win every single time – too adorable. 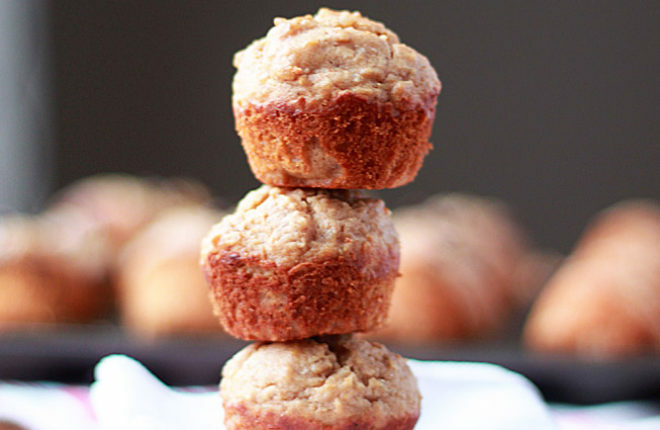 I’ve yet to try quinoa in muffins, too, but now I really need to add it to my kitchen to-do list. These look amazing. I’ve never tried quinoa in muffins! I love the idea of these! I really like quinoa in baked goods, and with the peanut butter here they’re a good dose of protein as opposed to the sugar bombs that so many muffins are. Definitely going to be making these! Thanks, Katie! 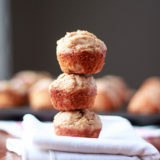 I am totally obsessed with quinoa in baked goods now – perfect way to sneak in some more good stuff. Just made these last night – amazing! After they cooled off I stored them in the freezer. Had four of them this morning and they tasted like right out of the oven. This is definitely one of my new favorite recipes! Could these be made as regular sized muffins? I’m sure they’ll work as standard-size muffins, but I haven’t tried it. I’d imagine it’ll make about 5 or 6 of them, and it’ll just take longer to cook. If you try it please report back on how it goes! just made a batch and everyone loved them so much I immediately made another (hadn’t even put the ingredients away)! My first batch made closer to 36 minis and there are 12 large and 12 minis in the oven right now. Love the use of leftover quinoa! Hi Rachel, hmmm … I’ve not tried these with almond flour, but now I want to! I’m sorry I can’t say for sure if it works well or not. I bet oat flour would be good. If you try either, please report back! And I’ll update if I try it as well. I think almond butter or tahini would be delicious and should work well as a 1-for-1 substitution. If you try it please report back and let us know how it goes!